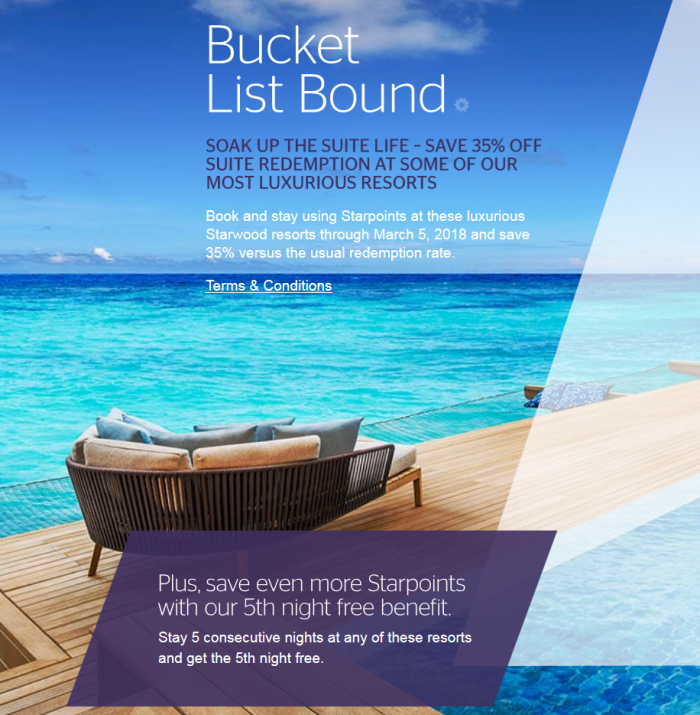 Starwood Preferred Guest (SPG) relaunched back in May its “Paradise Is Closer” 35% off award promotion for stays through March 5, 2018 (read more here) and has now added three more very high end properties to the list. You can save 35% off of awards at now eleven (previously eight) ridiculously priced (using Starpoints) hotels that don’t have “standard” accommodations available (suites only). SPG has now updated the website dedicated to this offer with the all participating properties for the year. Note that you can still get the fifth night free even when using this award type and save more on longer stays. These awards are not available online; you have to call SPG to book and remind them about the discount. These are some of the most expensive and usually overpriced awards that you can find from SPG due to the “non-standard accommodations” clause that results jacking up the Starpoints rate to the skies. SPG has now added three more properties to the discounted list that I mentioned earlier. First non-resort city hotel in Paris has made the list! Next articleUsing British Airways Avios Points To Pay For Contract Lounge Access – Is It Worth It?